How many times have you struggled to find the first step in the right direction towards your destination? Often times while using a map we walk in one direction and say, "Ooops! Wrong direction! Need to go back". Good news is that you can just "WAM" places on the phone camera right now! World Around Me (WAM) is an augmented reality based local discovery app that helps people in finding places to eat, drink, shop, stay, commute, pray, refuel, keep healthy or access money anywhere in the world. Available in 26 languages on iOS and Android, World Around Me is being in 200+ countries. It helps people visually orient towards a place by using their phone camera, with the help of Augmented Reality. This is a novel discovery experience provided with augmented reality. World Around Me also provides reviews, contact details and lots of essential information about the place of interest. World Around Me is Editor's Choice app on Google Play and was on one of Best apps of 2017 on Google Play. Earlier in 2016 World Around Me was awarded Google Play Award in Early Adopter category at a special ceremony conducted at Google HQ in Silicon Valley. It was selected as one of the top 10 apps among 4.6 million apps available on Android. It presently being promoted by Samsung, Google ad Huawei on their app stores. WAM also has partnerships with TripAdvisor and Apple. There has long been a search for a genuine use case for augmented reality. Good news is that World Around Me has been available on the stores since 5 years and gaining popularity amongst users who say it is a "life saving kit". So go ahead and download it on iOS or Android. So next time you are looking for a bank, atm, cafe, pub, book store, grocery store, museum, bus stop, metro station, pharmacy, gym, spa, a place to pray or any service, then “just WAM it”. World Around Me is a great app for both locals and travellers. Remember that WAM works worldwide including rural areas. 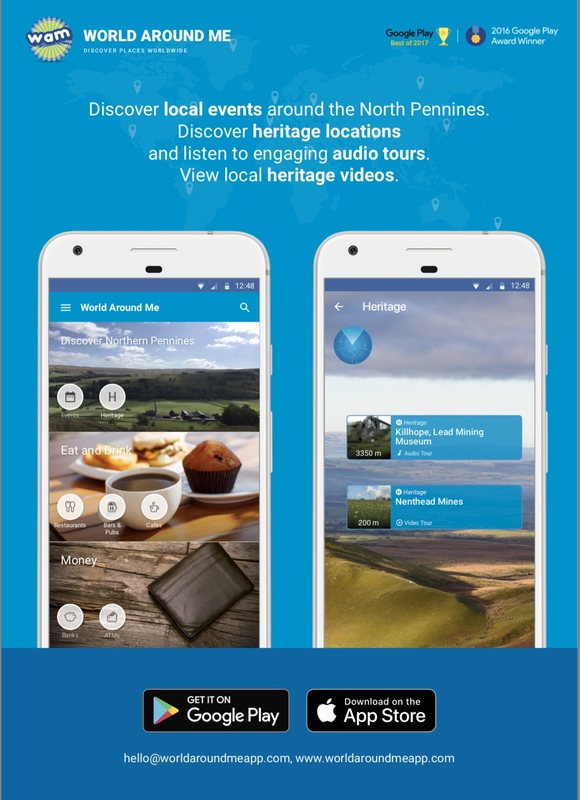 As a part of 5G Rural Integrated Test Bed WAM has been enhanced to enable tourists in the North Pennines region to discover local events and heritage locations in augmented reality. Further it also helps visitors discover local interpretive audio and video content which can be streamed over 5G using WAM app. The HD video streaming on concurrent devices using WAM is enabled by 5G. Rural areas still lack the basic internet connectivity. Fortunately 5G will be the first network in many parts of the North Pennines. This super fast internet connectivity will enhance the local visitor experience with the help of WAM. WAM users will be able to learn about local heritage through HD video content and audio content. Tourists use WAM to discover more places and tourism services within the region - leading to increased footfalls and longer visitor stays within the region. The impact of WAM usage on the local economy and improved visitor experience will be tested over the duration of the test bed. "Discover North Pennines" section is now available to use on WAM iOS. The Android version will be updated in the coming months as the project progress along. World Around Me (WAM) is an augmented reality based local discovery app (available on Android & iOS) helping people to find nearby places to eat, drink, shop, stay (hostels and hotels), commute, pray, refuel, keep healthy or access money worldwide. Editor's choice app on Google Play.